Paul and Melanie pashing on the couch at No. 28. MELANIE: No, silly, one of them's for Paul. Is he in the shower? DES (blankly): What would Paul be doing in *my* shower on a Sunday morning?! MELANIE: You know, Des, he's really different from what he's like at work. I mean, some people are boring at work and boring at home or just real slave- drivers, but Paul's different: he's sensitive and romantic... I always knew my secret admirer would be out there somewhere, but who would've thought it would be Paul?! MELANIE: I wish he didn't have to rush off like that. I can't wait to see him at work on Monday! CAROLINE: What the hell are you doing outside? CHRISTINA: Um... Breathing in fresh air! Eating my breakfast! CAROLINE (snaps): You're supposed to stay indoors; you *know* that. CHRISTINA: Oh, I forgot to tell you: I ran into him in the street. CHRISTINA: I really needed to get out and I was being so careful, but he took me by surprise. I think I worked it out, though – I just apologised. CAROLINE: If you need anything, give me a call. CHRISTINA (sarcastically): Can I have time off for good behaviour, warden? HELEN: I half expected her to be wearing her necklace. JIM: Well, the fact of the matter is, Helen, I haven't given it to her yet. HELEN (sighs): Why ever not? JIM: Well, I thought I'd wait until I'm sure that she has her priorities straight as far as work and the family's concerned. HELEN: So *she* thinks you've forgiven her completely, whereas you're still punishing her. Don't you think that's rather unfair? JIM (bluntly): Under the circumstances, no – and to tell you the truth, Helen, I am perfectly capable of handling the situation without *your* help. PAUL: Trouble. These are starting to appear in opposition to the playground development project. PAUL: Gran, why on earth didn't you tell me this before? HELEN: Well, up until now I didn't know you were the developer. And there's something else you may not be pleased to know: she's mustered up a lot of support in the neighbourhood – including my own. PAUL (snaps): Thanks very, very much. You know, I'm trying to get a project off the ground that's not only going to provide jobs, but entertainment in the area – and instead I face obstruction from a band of revolutionary, reactionary do- gooders. HELEN (curtly): That's a neat generalisation for a group of concerned parents and citizens. Jim chips in tersely that they're concerned parents and citizens who may just be ill- informed, and he asks Helen if it's occurred to her that the council wouldn't sell the playground if it was in regular use. Paul tells his father that he's having a little media get- together this afternoon at Lassiter's and he's going to point out the benefits for the community; by this time tomorrow, the opposition will be non- existent. Des drives out of the driveway of No. 28 and starts heading down the street. 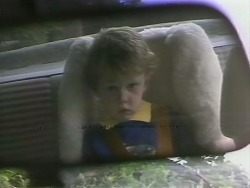 Jamie is in the back seat. As the car passes No. 22, Des sees someone coming out through the front door. It's Christina, who's wearing a blonde wig, a straw hat and sunglasses. Des remarks to himself that Linda must have visitors. MR. MUIR: Sorry for asking you to meet me at such short notice, Hilary, but I wanted to speak to you before the school gossip starts. MR. MUIR: I've just come from a meeting with the Education Department. I've been offered a new position as the Headmaster of a very large country High School. There are staff and academic problems, and it's going to be such a lot of hard work, but *what* a challenge. The last Headmaster had a nervous breakdown at the thought of returning again this year, poor man, but think what a feather it will be in my cap to get things running smoothly again. HILARY: Congratulations. I'm sure you'll do an excellent job. HILARY: I'll miss you, Kenneth. MR. MUIR: Er, Hilary, my dear, you misunderstood me. MUIR: No. I've become far too fond of you to leave you now. I was thinking perhaps the most satisfactory thing would be for you to come and live with me in the country. MUIR (quickly): Oh, no, no, nothing improper. I meant as my wife. I want you to marry me, Hilary. GLORIA: I never thought I'd meet the bloke game enough to take on Hilary! Working without a safety net, too! Hilary just sits there looking nonplussed! PAUL: Linda, that list is probably a little incomplete. Can you just add business associates and people we have day- to- day dealings with? He then tells Melanie that he'd like her to attend the meeting this afternoon and he asks ‘Linda' to explain the details to Melanie. With that, he walks out, leaving Melanie looking downcast. HILARY: No. No, no, Helen, everything's fine. At least, *I* think it is. HILARY: Oh. Oh, there's no trouble. My goodness, it's very hot in here. HILARY: Helen, Kenneth Muir has asked me to marry him. HELEN (looking surprised): Oh. Hilary, I'm so happy for you. That's *wonderful* news! HILARY: Yes. Yes, it is – but I need your advice. HELEN: Why? You're going to accept, aren't you? HILARY: Oh Helen, there's nothing I'd like *more* than to marry Kenneth, but everything's happened so quickly. HILARY: What I am trying to say is... Kenneth and I have become aware that we've grown fond of one another – but I've lived so much of my life *without* a partner, I really don't think I could make that adjustment. 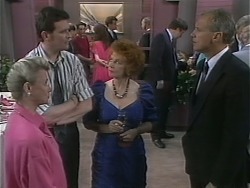 Helen tells Hilary not to sell herself short. Hilary says she'll have to consult Matthew on the matter. Helen, however, tells her that *he'll* be happy as long as *she's* happy; Hilary should do what's right for *her*. PAUL (sighs): *Adults* need playgrounds *too*, Des – *and* jobs. I think you might just change your mind when you hear what I've got to say. DES: I doubt it – but I'll listen. PAUL: It just goes to prove the old adage, doesn't it: there is somebody out there for all of us. Talk about the odd couple! Tsk – Hilary...! DES: Speaking of odd couples, how are you and Melanie working out? PAUL (shrugs): What can I say? You know, we both had a bit too much champagne and I guess I made a bit of a mistake, eh? DES: Well, why didn't you *tell* Melanie that, instead of just shooting through? PAUL: Well, I- I- I had a lot to do, you know? DES: Yeah, that's what *she* thought. She's keen on you, mate – she thinks there's a relationship in it. PAUL: I didn't promise her anything. Come on, Des, you know how it is, eh? Des tells Paul that if it *was* a mistake, he should tell Melanie and let her down gently. Paul, however, asks Des if he isn't just over- reacting a tad; Saturday night was no big deal, so they should just let it slide. Des sits there looking worried. 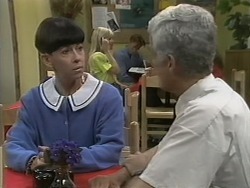 MELANIE: Wow, what a fantastic wig! Are you going to wear that to the cocktail party? MELANIE: You should – it really suits you. CAROLINE: Melanie, would you like a lift? MELANIE: You two could be twins, except for the hair colour! Caroline asks Melanie if she'd mind waiting in the car, as she and Christina have a few things to sort out. Melanie walks off, leaving Caroline to ask Christina angrily what she's doing outside. Christina explains that she needed the fresh air. Caroline snaps that they'll talk about this when she gets home from the cocktail party. MELANIE: You've been avoiding me all *day*. It's because of Saturday night, isn't it? PAUL (tersely): Melanie, this isn't the time to discuss that, all right? MELANIE: *When*? I've been trying to talk to you, but you keep ignoring me. You're acting like you're ashamed or embarrassed about what happened. PAUL (sighs): All right. Look, I am sorry. Saturday night is one of those things that... well, it shouldn't have happened. MELANIE: That's not very nice, Paul, just to use somebody and then *dump* them. I really *liked* you. I didn't think you'd treat me like this. PAUL (gently): Melanie, I didn't mean to upset you – but if my actions are going to interfere with our business relationship, then... well, perhaps you'd be happier working somewhere else, eh? MELANIE (tersely): Oh no you don't, Paul Robinson. If you think I'm going to quit my job just so you don't feel guilty, you've got another think coming. MELANIE: And don't even think about trying to sack me – the law's on my side. I'll take you to the Anti- Discrimination Board if you do. With that, Melanie walks out, leaving Paul looking frustrated. JIM: Nice turn- out, Linda – things seem to be going well. CAROLINE: Yes – Paul's proposal has obviously attracted a lot of attention. PAUL: Firstly, I'd like to thank you all for attending the little get- together at such short notice. Now, I have press releases here outlining the huge advantages that my project holds for the community. Entertainment and employment: two large aspects of our lives. Two large aspects that I intend to provide. 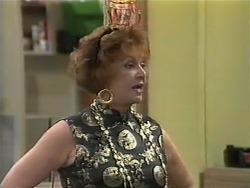 Christina walks into the function room suddenly and goes and stands next to Gloria. She looks around. Caroline spots her and, looking horrified, she ducks down and crawls under a table, where she's hidden by a long table cloth! Gloria comments to Christina that it's a terrific spread of food. Christina thanks her. Caroline crouches on her knees under the table, looking annoyed. HILARY: And... my answer is yes. MR. MUIR (smiling): Oh Hilary, I'm so delighted. HILARY: I feel quite impetuous! – and very happy. MR. MUIR: Your happiness means a great deal to me. MUIR: Of course, we'll want to consult mother. HILARY (her face dropping): Oh. Certainly. MUIR: Would tomorrow lunchtime be convenient? HILARY: Oh, I can't tomorrow, Kenneth – I'm due in court to clear up some ridiculous situation with the taxation department. HILARY: It's something that's just blown completely out of proportion – concerning interest I have on certain investments. Mr. Muir smiles that they'll arrange some other time for her to meet his mother. Hilary smiles that everything is happening so quickly. Mr. Muir tells her that there's one other subject to consider: their honeymoon. Hilary stands there looking suddenly worried. HELEN: Exactly. I hate going against my grandson, but I can't agree with what he's doing. 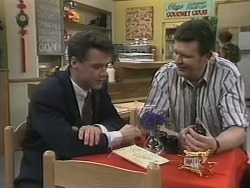 JIM (exclaims): I can't *believe* you two: he's helping Erinsborough grow; creating jobs. CAROLINE: What are you doing here? Are you trying to get us *killed*?